Silk is big in Lyon and has been for a very long time. I've been here more than once and heard the history and its importance more than once, but the details of history don't stick in my mind, never have and, at this point, never will. So if it's a history of silk and silk manufacturing you want, find something authoritative to read. There are stories of intrigue and competition, royalty and silk laborers. The silk workers and manufacturers centered on one of two plateaus in Lyon, this one known as the Croix-Rousse. I've more or less been thinking of that as "red cross," but just thought to check it out in Google translate, which informs me it is "cross red-head." I'm not convinced. 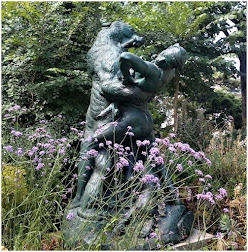 There are a couple of kinds of passageways, known as traboules that we learned about and visited, here the stairways that shorten distances vertically from, for example, a winding pathway or street down a hill. The other type shortens distances horizontally, providing passageways through long rows of buildings. Only trouble is that this particular neighborhood happens to be an enormous mural, with representations of the people and professions in the Croix-Rousse. This is the third version of the mural (1987, 1997 and 2013). In each of those years the artists returned to "age" the characters in the mural appropriately, and it's the plan to keep up this tradition. Not only is this the biggest mural, this version is the most true-to-life, not using almost-caricatures found in other murals, and, to a degree, in the earlier version of this one. Here are views of some of the details as our ladies move in for closer looks and photo ops. Our guide Sandrine explains the mural to our group, gathered around her. See "Les Routes de La Soie" on a sign. You know if there are kittens, I will show them. Way up there, a construction crane. "They" finally coax me into going up for my photo with them. 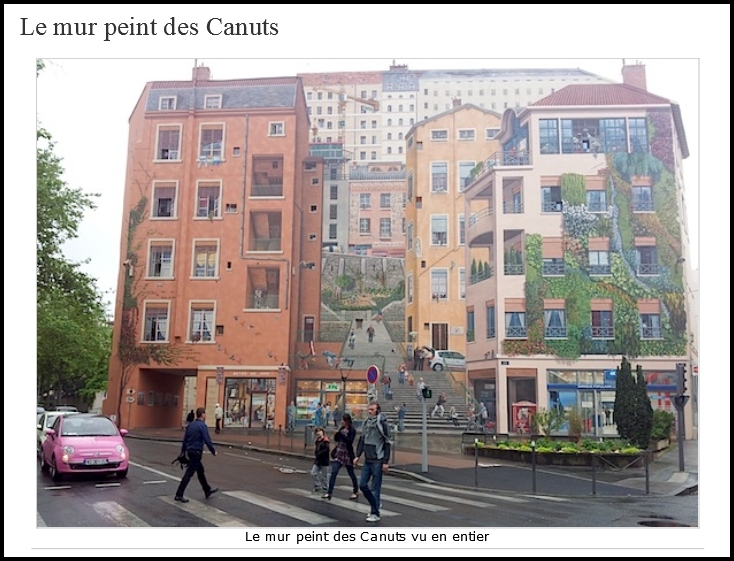 A further explanation of the mural (in French) can be read here on a Lyon Visite page. This is their photo of the complete mural. I truly could not tell you anything about the underlying building. It's convincing in person, even as you know it's a mural.